4.1 out of 5 based on 69 bloggers and 8 commenters. 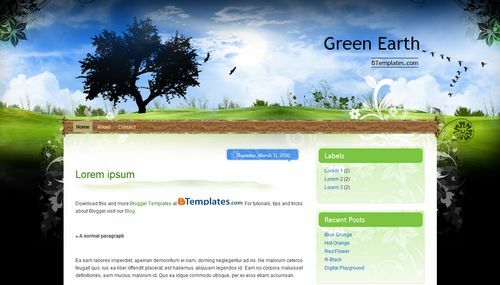 Green Earth is a free blogger template with 2 columns, right sidebar and rounded corners. Amei o template muiiiito bom, obrigada!! I would like to change the font on the template. I’ve tried going through the layout option on blogger and it doesn’t work. Any suggestions? Does this template allow images with transparent backgrounds? I’m trying to set one in my header in place of my blog title on my current template, Night Sky 2.0 (which I LOVE), but it doesn’t seem to allow images with a transparent background. I am planning on changing to template one soon, and want to know whether or not I’ll be able to use the image I created. Can anyone answer this for me? Thanks! Can I get this background in a 3 column application.I like the scenery but would like more amenities. I like this template. Is there a way to change this to 3 column or a link to one with 3 column? I looking a template like this but… i thinks it is to simple.. i must do some change to this template.